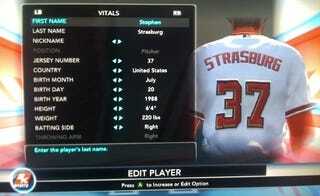 As promised, MLB 2K10 won the race to be the first to put Washington Nationals' phenom Stephen Strasburg into the official roster, and their version is nothing short of superhuman. Try a 102-mph fastball. To those who followed the righthander since his career at San Diego State, this will not be much of a surprise. Scouts have vowed that he hit 103 on the radar gun in workout sessions. But it's paired with a 91 control rating (and 89 movement), so, that's why you're going to see a lot of the Washington Nationals - a sub .500 club - in multiplayer for the time being. Bear in mind, this list has only nine pitchers clocked at 102 or higher in a regular or postseason game. A quick but not comprehensive survey of the hardest throwing starters in MLB 2K10 finds they have less oomph than Strasburg - Detroit's Justin Verlander has a 96 mph fastball, Colorado's Ubaldo Jimenez has a 98-mph heater. Tigers relief pitcher Joel Zumaya, clocked at 104.8 mph in a 2006 game, has a 102-mph heater, the only other one I could find on short notice. But wait, there's more. 2K Sports gave Strasburg a 97-mph two-seam fastball, which is supposed to be a livelier but slower pitch. That's still faster than the top percentile of four-seam throwers. His slider is 92 mph and the change is 86 mph. Correction: Strasburg's fifth pitch in this game is a 12-6 curve (at 78 mph, but movement is more relevant than speed). Strasburg uses this more than any slider. How does that match to reality? In his sensational 14-strikeout debut, Strasburg hit 100 only twice - both times in the second inning. He also had a change clocked consistently between 89 and 91 mph in that game, so if he's underrated in anything, it's that pitch. Interestingly, 2K Sports gave Strasburg a Derek Lowe windup, lacking a personalized throwing motion for the rookie. Bet he has one next year.